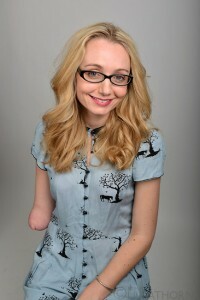 Earlier in May, I was lucky enough to get the opportunity to interview CBeebie's presenter and picture book author, Cerrie Burnell. 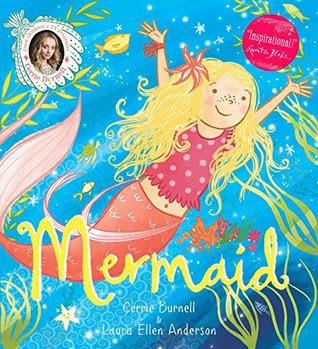 Cerrie recently had a picture book entitled 'Mermaid' published, so Cerrie kindly agreed to take part in Mermaid Mania. 1) How did you come up with the idea for Sylvia to be a mermaid? She started off as a mermaid. I’ve always loved the sea as I lived by it up to the age of 20. When I was younger, I used to dream of being a mermaid. By including her disability, I saw this as a positive trait. I’ve never considered myself as disabled, until I joined an inclusive theatre company where I made the change from being an actress to a disabled actress. I felt empowered by this label. Making Sylvia a wheelchair user, seemed an obvious step for her character. In the Little Mermaid, the mermaid had trouble walking and many wheelchair users I know find a freedom within the water. So it all seemed to come together perfectly. In the Mermaid, I wanted Sylvia to be the one with a skill though, which is rarely done in fiction, you never see the disabled one as the teacher. 2) How do you juggle writing with a TV career and being a mum? I get lots of support from my parents. Also the wonderful thing about writing is that it can be done anywhere. You see writers showing photos of all these gorgeous places they write; I don’t really have anywhere. If you are going to write, you will do it wherever you can, come what may. Many writers have full time jobs and manage to fit writing around it. You just have to commit to it. I’ve always written since I was a child. Now it is a big focus for me and I tend to write in the evenings, once my daughter is asleep. I treat it as another job. I was fairly isolated when I moved to Manchester, but I found a sense of joy and peace when writing. 3) Quentin Blake has been quoted on your cover, calling it ‘inspirational’, how did that make you feel? Oh that was lovely. I’d seen his The Five of Us book which is about a group of children who each have a disability. However the disabilities are only referenced through the illustrations. I decided to contact his agent and send a copy of Mermaid to him to read. You never know if these things will get through and Quentin is in his eighties, so I didn’t think any more of it. I received a lovely email back from him, saying that he wished he had thought of it. I was so lucky that he took time to read it. For someone who grew up surrounded by Roald Dahl books, this was a really moving experience for me. 4) What are you working on right now? I’ve just finished Ballet Dreams which will be published in March 2016. I’ve also been working on the first chapter book in the Harper series, called Harper and the Scarlet Umbrella, which will be out in October. Laura will be illustrating this book for me as well as the second book in the series, which I am also working on at the moment. I’m also in the process of adapting a play into a screen play. 5) If you could be a mermaid, where would you like to swim to? The Caribbean - I was lucky enough to go there on a holiday last year. It was a one off type of holiday and I got the opportunity to swim with the turtles. I would also love to swim somewhere cold. The waters around Iceland would be good, as a mermaid wouldn’t feel the cold. 6) Would you like to read Mermaid on Bedtime Hour on CBeebies or would you like someone else to read it and if so who? We are not allowed to have our work read on the CBeebies channel as it would be seen as an endorsement and the BBC isn’t commercial. I’ve always been aware of this and I wouldn’t want to challenge that. If I could have someone read my book for me, I would probably pick a wheelchair user, such as Tanni Grey-Thompson. 7) Who are your favourite authors now? I still love reading children’s books. To Kill A Mockingbird is a favourite. I’m really excited about the new Harper Lee novel coming out in June. JK Rowling - I love the Harry Potter books. I’ve got a lot of respect for JK Rowling. How she began her career, writing in a cafe with her child. Who she always handles herself with grace. I love books with unusual stories, as well as diversity. I really enjoyed The Miniaturist recently - beautiful and a real surprise in the book. I also enjoyed The Sin Eater’s Daughter by Melinda Salisbury - very strange and beautiful. I loved Abi Elphinstone’s, The Dreamsnatcher too. I try to make time to read the classics too. I like to read The Bell Jar every now and again. 8) If you had to recommend one author, who would it be? Probably Catherine Rundell, who wrote Rooftoppers. She has a new book coming out in September - The Wolf Wilder. Also Abi Elphinstone - I think The Dreamsnatcher will be really popular. Another author I would recommend is Timothee De Fombelle. I loved his two book series Toby Alone and Toby and the Secrets of the Tree. They are the most spellbinding books I’ve read. Also his second series, Vango. 9) What do you hope young children will get from your story about Sylvia and Luka? I really hope to inspire a love of the sea. Also that anyone can learn to swim, as it is activity anyone can enjoy. Sylvia is an amazing swimmer. She is also strong, and very determined. But only Luka knows that she is also a mermaid! As the two become friends, they set off on a magical journey they will never forget.